Someone in the forums recently asked about ways to migrate individual accounts from one ZCS instance to another, so thought I’d share the enlightenment with all. Whether you are going from an on-premise install to a hosting provider, want to create handy archives of old employee accounts, or just need to duplicate mailbox contents of a user; the syntax in this article proves remarkably useful, and applies to all editions. There are a multitude of comparable RFE’s on addressing this need via different approaches. (Bugzilla entries 19630, 29573, 28443 & 30163 to name a few.) Some want graphical tools to browse data and selectively migrate certain things, while others would be happy with a cross LDAP zmmailboxmove. Depending on your situation, several backup tools can take care of a large portion of your daily needs; and there are ways to do Zimbra-to-Zimbra migrations using the Network Edition’s backup and restore capabilities – however they require admin abilities on both systems. Meanwhile, most of the frequently used open source backup solutions are simply an “all accounts at-once” approach. So what to do when you need to move from your personal setup to a hosting provider? Or if you’re a hosting provider, move a tiny handful of accounts to a separate infrastructure? Before diving into the wiki on user migration for info on Imapsync, REST exports, CURL imports, etc; there’s a handy way to avoid the “one item type at-a-time” transfer methods. Next transfer via rsync, scp, sftp, etc. You’ll also need to create the account on the 2nd server if the desired account doesn’t exist at your destination server yet. “skip” ignores duplicates of old items, it’s also the default conflict-resolution. “reset” will delete the old subfolder (or entire mailbox if /). “replace” will delete and re-enter them. ‘Reset’ will be a bit faster on an empty destination mailbox because it skips most dupe checks. Note: There were some duplication fixes and additional issues (mainly sync related) corrected with the tar formatter in 5.0.10. Infact, this same technique is currently used in Zimbra Desktop’s alpha backup solution. Most of these solutions aren’t going to respect share permissions, but when pulling an account out of an environment that’s to be expected. If moving your entire server, I’m a huge fan of the install.sh -s trick when using NE backups to do so isn’t an option. Have another method you’d like to share? Document it in the wiki & note it below, or you can discuss over in the Community Forums. Interop: Connect as one unit. I’m have Debian Lenny 5.0 and zimbra Release 6.0.5_GA_2213.DEBIAN5 DEBIAN5 FOSS edition. On the old server backup is OK.
Could you help me to find the right way to backup user who use LDAP? 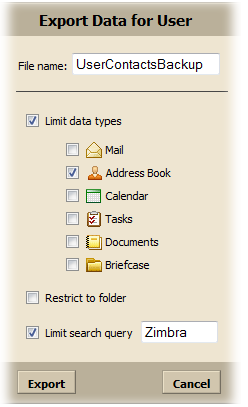 zmztozmig migration does not migrate shared calendar and shared files. Is there a way to migrate these shared resources via commandline tools? zmmailboxmove maybe? If they share the same LDAP master or cross LDAP?